October 2009 – Hurley Books – How do you do? Steve stopped the car outside the shop and popped in to look at some folios that had been dropped in for us to consider buying whilst I set up. This involves putting out a few boxes a pound books on the table in front, hanging up some postacrd racks, unfurling the flag and popping out the A frame. Jetty Street, where our shop is situated is a tiny, skinny street, no pavement, one car wide and a tight turn onto Fore Street. We regularly watch as transit vans have to reverse back up the street to try to find another way out of the village. Anyway, having stopped the traffic for a few minutes Steve dashed off. Anyone used to living and working in “quaint” locations knows that cars stopped in the middle of roads is just part and parcel of daily life. We all learn to live with it and relax; getting shouted at, beeped or having to listen to advice on closing the roads to traffic is something that you just learn to grin ands bear. The folios were nice so we’re trying to get hold of the lady at the mo to say yes please. A lot of our day is spent trying to track people down. As I walked back into the shop two children ran down the street shouting if we had put up a new puzzle yet? Today’s blackboard puzzle reads “Tracey’s mother has three children. April, May and … ?” We’re getting lots of people giggling when they work it out, groaning when they don’t. It’s half term so there are lots of children about at the moment and because the roads are so terrible, traffic is at walking pace only and so the children tend to have a lot more freedom to wander than in larger towns and cities. It seems to give them greater confidence. In winter, the village children play tag up and down the streets, it sometimes feels as though someone has wound the clocks back a century, groups of primary school children run around shouting with laughter in the dark. We’ve been really busy today with a real mix of customers in and I’ve been fiddling with Spotify trying to organise a good playlist for the shop. All sorts on there now from Rolf Harris to Vampire Weekend and of course we take requests. At one point a group of ladies from Wales joined in on Bread of Heaven. Imagine being in a shop where in one part children are building a train track in another corner a boy is settled into a beanbag with his nose deep in a Philip Reeve, further back a group of ladies are harmonising to the Male Voice Choir and then at the back Classic FM is softly soothing the sci fi browsers. Oh and dogs, did I mention that we let dogs in the shop? Reading back it sounds like chaos but honestly it has a really homely feel. I’m in the middle of trying to organise an author event. it will be my first commercial one – used to do loads in the library services but this is the first time where I will also be hoping to make a bit of money. Well, Steve is hoping to make the money – I’m pretty hopeless at that side of things, I just want everyone to get the book they want. Once a librarian always a librarian. Our author is E.V.Thompson and he’s also agreed to switch on the Christmas Lights so on the 5th of Decemeber he will be signing copies of his new book here in the shop and then switching on the lights. Really looking forward to it. More of this – much more I imagine – later. So that is how today is going, I imagine we’ll close around 5. It will be dark and everyone will have retreated to their fires and food, snuggled up with a good book (hopefully) a nice glass of something and ready to relax. 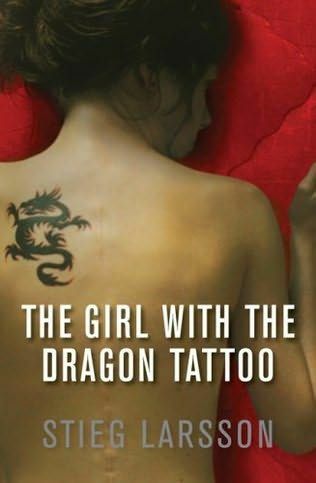 Well, I finally got around to reading my proof copy of Dragon Tattoo, yes I know, I’ve had it a while – good grief the third book has come out in the time it’s taken me to pick it up. Not sure what was putting me off but a friend commented on how much he had enjoyed the first two books, so I guess I thought what the hell. For some reason, despite all the hype and actually having the book on my shelf I didn’t realise that it was a crime story. Given that the author was a crusading journalist (died prior to publication of his thee books) there is a large section of the sory that buzzes with corporate skulldugerry, financial reporting and investigative journlism. It was interesting up to a point but to be honest a lot of it left me behind. That said I really enjoyed the story and only skimmed the technical mergers sections. The majority of the story revolves around the disappearance of a girl some 30 years earlier and the emergence of the book’s main female protagonist. I found her the most interesing thing in the book, she’s brutal and vulnerable. I’m rather hoping that the next two books focus on her – I’m guessing that they do. Plot was guessible but it was the characters that drove this story.